In this video we join Sosha in the park as she secretly wears a diaper under her skirt. Sosha loves to be naughty in diapers, especially wearing them in public. 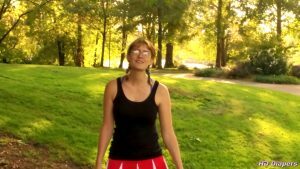 In this video we get to join her as she spends some time in the park, wearing a diaper under her very short skirt. Teasingly, she gives us some glimpses of her diaper, hoping that no one else sees as she does so. As we spend time with her in the park, she talks about her love of diapers, and even confesses to us that she just used the diaper in the course of shooting this video.